It's string. That goes between your teeth. I would have never thought in a hundred years that floss could be improved upon. It's just string, after all. Then I used Glide. This floss was unlike anything that I had ever used. Perhaps it's odd that I'm so intrigued by floss, but for a guy who's about to pursue a career in brand and product management, this is about as good as it gets. To me, Glide is a prime example of someone taking a boring, ordinary item, and making it extra-ordinary. Something worth talking about. And I think the name fits the brand perfectly. What else can be improved upon? Toilet paper? Disposable razors? Spaghetti sauce packaging? I think everything has room for improvement. Upgrading floss demonstrates that. I don't know what I would do without Glide. 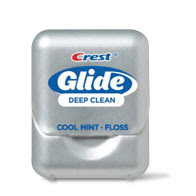 It is without a doubt the floss I have ever used. Way to go P&G!! !